The Reitjes originate from the small river Reie that flew through the town. In the course of years the river was canalized and secondary canals were also dug. In a number of places, the Reitjes have been overarched. An example of this is the Kraanrei that flew from the Dijver alongside the Markt to the Jan van Eycksquare. The flow of the canals was regulated via a lock-chamber at the Minnewaterpark. The canals were the commercial arteries of the town; through them all the shipping was done. 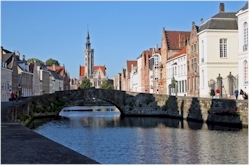 These streams with their numerous bridges still cut through the historic center of the town and are at the origin of Bruges' most known nickname: "the Venice of the north". 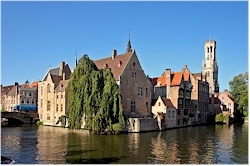 Here and there you will also spot the famous swans of Bruges on the water. 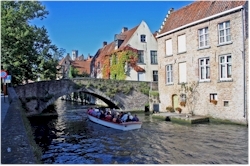 If you want to see Bruges from another perspective, you can try one of the town's most known touristic attractions: a boat trip on the Reien. You can depart from several spots in the center but be aware that on busy days, you may have to queue a bit.